LAFAYETTE, Ind. — Joe Peters will be performing at the Historic Lafayette Farmers Market this Saturday, May 29th for the Swing into Spring celebration. Lafayette Fun Squares will be showcasing square dancing and Stacy Bogan will be on hand to do coal portraits from 10:00am until noon. 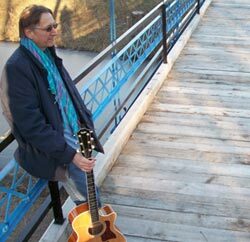 Market patrons can enjoy Peter’s blend of acoustic and folk rock from 7:30am to noon. Asparagus, spring lettuce, radishes, early season greens, flowers, kettle corn, meats, free range farm fresh eggs, flowers, honey, dried herbs, baked goods, arts and crafts are all available at selected times during the 2010 Market season which runs through the end of October. The Lafayette Farmers Market, managed by the Downtown Development Council of Greater Lafayette Commerce, will be open on Tuesdays and Saturdays from 7:30 am – 12:30 pm and on Thursdays from 3:00 – 6:30 pm at the Dauch Alumni Center on the Purdue University campus through the end of October. In addition, the Sagamore West Farmers Market will be in operation on Wednesdays from 3:00pm–6:30pm through October 27. Information regarding this market can be obtained on the City of West Lafayette website, www.westlafayette.in.gov. For more information or to become a vendor at the Lafayette Farmers market, contact Erin Nelson at Greater Lafayette Commerce at (765)742-4044.